The Bamileke peoples believe the king (fon) is the representative of the Supreme Being and the ancestors and has supernatural as well as religious and political powers. The fon, however, does not control human behavior. Secret associations acting on behalf of the king establish and enforce social order. One such association is the Kuosi (or Kwosi), which began as a warriors' or regulatory society and evolved into one composed of wealthy titled men. Kuosi members serve not only as the fon's emissaries but also as the protectors of kingship and as such remind the fon that he is not above reproach. 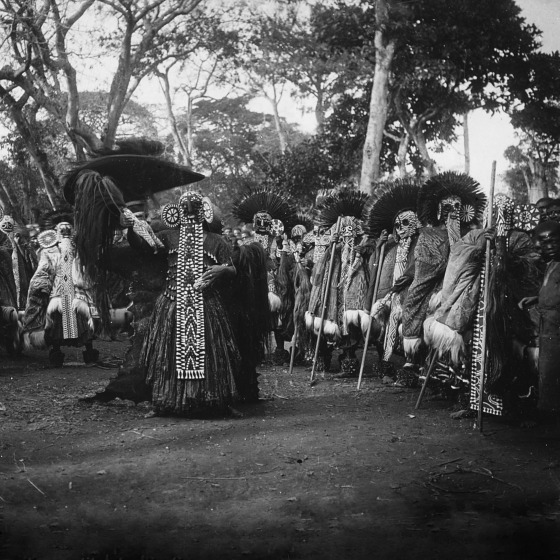 Wearing a beaded cloth mask with elephantine features, Kuosi members perform the elephant dance (tso) in public on ritual occasions, major festivals, and funerals. Sometimes the fon appears as one of the masked dancers. The Kuosi masquerade had been described as "the most spectacular and prestigious Bamileke ritual performance." The beaded mask (mbap mteng) is worn with an indigo-dyed cloth (ndop) decorated with colobus monkey fur and a leopard pelt and may be worn with a headdress of red feathers from the tail of an African grey parrot. Long panels hanging down the front and the back of the tight-fitting hood represent the elephant's trunk. Stiff, large circular ears are attached to either side of the hood and flap when the dancer moves. The facial features, which are humanlike, are made of padded cloth so they project from the cloth background. Royal symbols lavishly beaded on the mbap mteng include an iron double-gong, a frog (symbol of fertility), a spider (emblem of the earth into which the ancestors are interred), a toad, lizard, crocodile, and serpent. These depictions, which may be naturalistic, schematic, or abstract, may all appear in the same composition. One theory for this occurrence is that the naturalistic designs are reduced until they become triangles, which are further transformed into the lozenges, circles, and squares. While all mbap mteng conform to the basic form described, the arrangement of the beaded icons varies from mask to mask. The Dallas Museum of Art's mask is distinguished by dissimilar patterns on the ears and by the lavish application of beads, including the reddish tibular ones at the back of the hood. The earliest masks, which date from the 19th century, are characterized by a conservative use of beads (mostly black, blue, and white) that were imported in limited quantities from Venice and Czechoslovakia. Because beads were used as currency—and therefore a symbol of wealth—the mbap mteng also means "a thing of money." Imported beads were more plentiful and more colorful after World War I. Beads of various colors distinguish the Museum's mask, suggesting a date of between 1920 and 1930 for its creation. The gray parrot's red tail feathers are as precious and significant as the expensive imported beads. Gray parrots produce few tail feathers; to have a headdress made of so many feathers is impressive. Rarity aside, the selection of this bird probably has as much to do with its superior intelligence, which is an attribute of great leaders. On a practical note, the feather headdress is collapsible. Roslyn A. Walker, The Arts of Africa at the Dallas Museum of Art (New Haven and London: Yale University Press, 2009), 70-73.